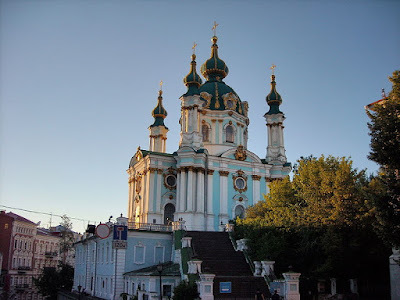 With filial love and honor, we, bishops of the Ukrainian Autocephalous Orthodox Church, turn to your All Holiness with synodal request to extend your labors with healing the church schism in Ukraine. Realizing the value for the Great Church of Constantinople and the whole of Orthodoxy in general of the preparation of the Great and Holy Synod of the Orthodox Church, we raise our own prayers that this Synod would be convened as soon as possible, and its actions helped to update and consolidate the Orthodox Church. However, we ask your All Holiness, as the good shepherd, do not miss the pastoral care and problems of the multimillion Ukrainian people, who today suffer from a split in their church. The tragic division of the Ukrainian Church in church consciousness was due to the crisis that broke from the ideal of Christian universality. Heading towards the Ecumenical Orthodox, our Church has condemned ethnic phyletism's [as a] unified ideology and declared the abandonment of ethnic phyletism as a means of church building (Statement of the Bishops' UAOC on August 15, 2006). However, as witnesses and members of religious processes, with sadness we note that without the active participation of the Ecumenical Patriarchate the new universal dimension of Ukrainian Orthodoxy is not completely solved. Unification of the Orthodox Church in Ukraine can not be formally or mechanically. Achieving unity should be the result of the process of the recovery of consciousness and church life, releasing them from external secular motivations. We strive to gain a complete ecclesiology, aspire to a united Christian Church being the discovery of freedom and universality. With this in mind, we can not accept as the basis of association/(re)union the proposed idea of restoring us to the Russian Orthodox civilization or other secular values. Your All Holiness! Today, when our church is suffering from separation, we call on you to not only pray for healing the split in Ukraine, but also to provide us with medicines that can heal wounds on the body of the Ukrainian Church. e. opening in Kiev of a Metochion or Information and Cultural Center of the Ecumenical Patriarchate. On the other hand, the episcopate of the Ukrainian Autocephalous Orthodox Church once again turns to the countenance of the Mother Church, to escape from the artificial canonical isolation, and recovery fellow participation with the World Wide [or Ecumenical/Universal] Orthodox, our church is ready and wants to join the Ecumenical Patriarchate, with the rights of autonomy. While gaining autocephaly was and remains the strategic goal of Ukrainian autocephalous movement, to overcome the division we are ready to go for significant concessions, sacrificing their own interests for the greater good of the Church. Given this, the episcopate of the Ukrainian Autocephalous Orthodox Church appeals to your All Holiness to request to intensify dialogue and to consider possible compromise solutions to the Ukrainian church matters.